Legal Players-Any player entering Kindergarten or First grade in the fall of 2014. Playing Field-Games are played on a 60X40 yard field split into four 15-yard playing zones with two opposing end zones. Gear-Each player must wear a numbered game jersey, mouth guard, and flag belt. Molded rubber cleats are optional (no metal cleats are allowed). Kneepads and elbow pads are optional. No jewelry. The flag belt or any portion of the flag may not be covered up by the jersey. The jersey must be tucked in. The flag belt must have a minimum of 2 flags worn directly below the shoulder, on the hip. Minimum flag size is: width = 2” and length = 14”. Playing Time-Each game will consist of 2 halves. A minimum of 20 plays (penalties do not count) or 25 minutes, whichever is longer, will occur during each half. Half time will be a 5-minute break. Each player will play a minimum of 20 plays per game, thus each team will need a play counter for players and an official game play counter. The officials will keep the game clock. Roster-Each new roster will be set by a blind draft. New players will be placed at random. Returning players will be placed on their previous team. Each coach is allowed 3 recruits per season. Practice Schedule-Practices may begin two-weeks after the official tackle football season begins. Pre-season practices can occur 3 times per week for a maximum of 90 minutes. Each team can have a maximum of two 90-minute practices during the week before a game. Game Schedule-Each team will play a minimum of 6 games with a 2 week tournament at the end of the season. All games will be played on Saturdays. Rules-The football size will be the K2. A typical coin flip awards the first possession. Each team is allowed 2 timeouts per half. One coach is allowed on the field at all times. Play will begin on the 12 yard line with new downs at each 15-yard zone. The team on offense has four downs to advance the football into the next 15-yard zone towards the opponent’s goal. If that team fails to advance the football in 4 downs, then a change of possession occurs at that spot. The offense has 30 seconds to snap the football once the official has blown the play whistle. There will be no kickoffs, field goals or punts. After a score the team with possession will start at the own 12-yard line. All point after attempts are from the 5-yard line. All defenders may rush the ball from a distance of 3 yards from the line of scrimmage. This get back zone is called the “Defensive Belt” and is an imaginary line that continues from sideline to sideline. Two cones tied together, 3 yards apart, will be placed by the referee at the spot of the football to designate the Defensive Belt. These cones advance as the football is advanced by the offense. The offense is allowed to run or pass to advance the football. All blocking must by with locked elbows from an upright position with hands into the defenders chest behind or within the Defensive Belt ONLY. All blocking is a shield (straight arms or arms crossed) action only with NO ATTACKING. No blocking is allowed beyond the Defensive Belt and will result loss of yards. Each team shall field 7 players for all plays. If a team cannot field 7 players, then the opposing team must match numbers down to 5. If a team cannot field a team of at least 5 players, that team forfeits the game. All players on offense are eligible to run the football or catch a pass. The coach on the field for offense has the option to snap the football to start the play. Once the football is snapped, the player receiving the snap cannot advance the football beyond the neutral zone unless he first hands the football off to another teammate, pitches the football to another teammate or legally passes the football to another teammate. If the snap is fumbled, the QB can recover the fumble and proceed with the play as directed above. If the defense recovers the fumbled snap, the play will be blown dead and the offense will retain possession with a loss of down. The player receiving the snap and after the handoff, pitch or pass can now legally receive the football again and advance from anywhere on the field via a handoff, legal lateral or legal pass. 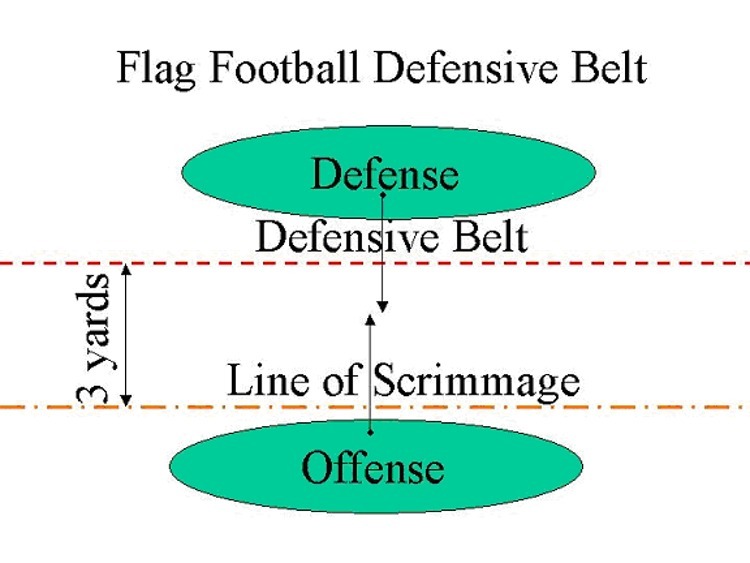 No defender may align inside the 3-yard defensive belt. As many as 6 offensive players are allowed to line up on the line of scrimmage but must be on their own side of the neutral zone. You must have at least 2 offensive players on the line of scrimmage but must be on their own side of the neutral zone. One man in motion is legal as long as the motion is backwards or parallel with the line of scrimmage and the player in motion is off the line of scrimmage at the start of the said motion. There are no fumbles. If a player fumbles the football during any play the football is blown dead at that spot. A defensive player is allowed to advance the football after an interception. Once a defensive player pulls a flag, the player advancing the football is down at that spot. If the player advancing the football has their flag belt fall off, then that player is down at that spot. If a player advancing the football falls down or has one knee touch the ground, then that player is down at that spot. All penalties, if accepted, will replay the down. Overtime-Time permitting; overtime shall be played per the NFHS overtime system from the 10 yard line. Tournament-A post-season, double-elimination tournament will be scheduled for the 2 Saturday following the regular season.